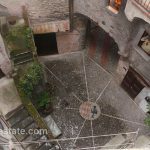 On the outskirts of the historic town of Isolabona, one of Italy’s loveliest cities, is this “high tech” apartment for sale 140. Isolabona is located in the province of Imperia (Liguria region). All primary facilities are present here such as; a grocery, a pharmacy, restaurants, bars, etc., and at a distance of only 20 min from the beach. Isolabona is located at a point where three rivers meet. The name Isolabona comes from the Latin name Insula Bona and means “isle of trust” and is the one of the most beautiful of the 10 very different medieval towns to “La Strada del Olio”. Isolabona began to develop as a town in the thirteenth century when the Doria family built a castle to defend the road to Apricale hostile forces. The only remains of the house today are the quadrangular tower and walls with the arched portico. The apartment is located next to the ruins of the Doria castle and is named the hayloft (fienile ). At the time of the Doria’s this was a part of the castle where the hay storage for the animals was. The owner has filed a permit application for a roof terrace overlooking the ruins and the roofs of Isolabona. The apartment is high tech equipped with remote led lighting (colour adjustable) music throughout the house. The apartment is ideal as a holiday home or as an investment project for rent. Although the apartment is in a very high and luxury standard and directly suitable for habitation we can imagine that you might have refurbishment or renovation wishes. Liguria Estate has specialized over the past 10 years in acquiring local permits, constructions and renovations, Project Management and other necessary work. We are happy to serve you!